Dedsheet is a sound insulating and vibration damping sheet for steel with good physical and weather-proof properties and utilising good vibration damping and sound insulating properties boosted with high functional heavy fillers and additives. 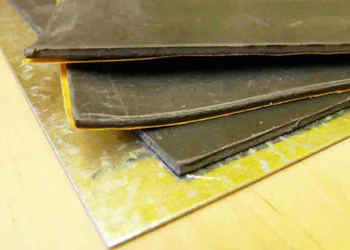 A mineral loaded self adhesive pad approx 2mm thick to reduce vibration and drumming inside metal doors, metal roofs, bulkheads and floors and any other thin metal construction. Dedsheet is designed to minimise radiation of noise created by ringing and vibration of sheet metal by sound damping and stiffening it. Also improves airborne sound insulation by adding mass. Unlike many conventional sound damping sheets, Dedsheet remains flexible through temperatures from -30 degrees centigrade up to + 65 deg for limited periods and will not crack when flexed. Available in smooth faced panels from recycled mineral loaded plastics, although the colour is normally a dark shade of grey it will vary. Application Usage: Any thin steel structure that is prone to ring or resonate. As a general rule of thumb, enough of the panel should be applied to cover most of the area of steel for best results. Check out the video showing how effective the product is. Resistant to moisture, sound damping properties eliminate ring, noise and vibration from metal surfaces such as ducts, housings, panels, pipes, chutes and can be used in dirty environments. Ensure the surface on which the damping sheet is to be applied is clean, dust free and degreased. Cut the damping sheet to size using large scissors or a Stanley type knife taking necessary precautions not to cut yourself. Remove the release paper from one side revealing the adhesive. Carefully apply the damping sheet to the surface by applying one side initially then pressing it carefully down ensuring no air bubbles have been trapped. The adhesive is extremely strong so the pad may not be easily removable once applied so take care to get it right first time.